Hospice Volunteers provide a valuable service to the SSM Health at Home - Hospice Program. Hospice is a special type of care focused on providing comfort and support to patients and their families facing a terminal illness. Hospice care is provided by a team of specially trained professionals, volunteers and family members. The goal of hospice care is living fully to the end of life by offering comfort and dignity. Volunteers are an essential part of the Hospice team. Volunteers have the opportunity to work directly or indirectly with patients and their families. Volunteers working directly with patients and families may provide companionship and support to patients and respite to their families. Other volunteer opportunities may include; clerical assistance, public outreach, or helping with fundraising and special events. Volunteering times are flexible. Candidates should be compassionate and dependable with a sincere desire to make a difference in the lives of others. Free, comprehensive training is provided and no medical experience is necessary. Volunteers take part in annual trainings and maintain volunteer requirements. 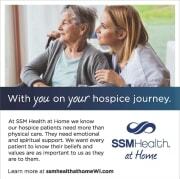 Become a SSM Health at Home - Hospice Volunteer and request an application today.